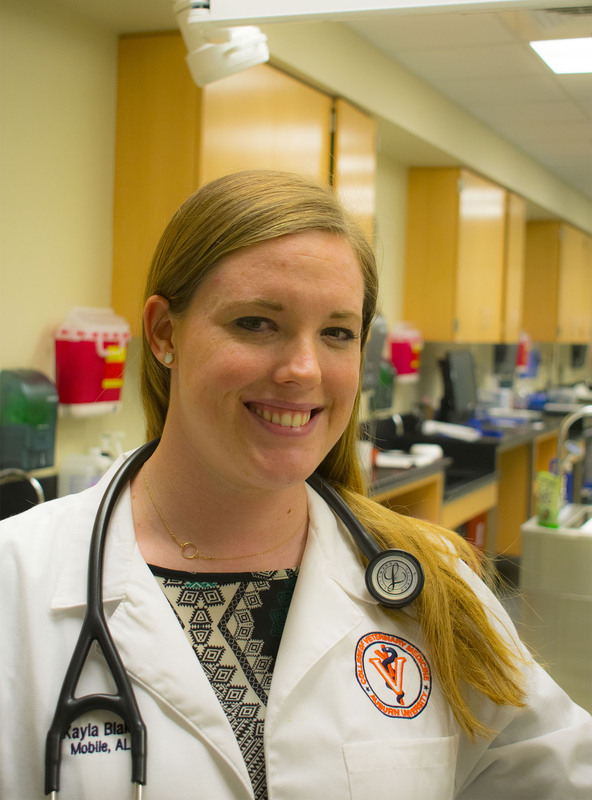 Kayla Blake, a third-year veterinary student from Mobile, Ala., is a 2017 recipient of the Merck Swine Veterinary Scholarship. Kayla Blake, a third-year veterinary student from Mobile, Ala., is a 2017 recipient of the Merck Swine Veterinary Scholarship. She is among only five recipients awarded the scholarship worldwide. Blake is pursuing a swine specialty in production animal veterinary medicine. Growing up in one of the largest cities in the state of Alabama, Blake doesn’t have a farm or large animal background. “I did not grow up on a farm and I did not have any experience with pigs before I got to Auburn,” Blake says. She says that she always has enjoyed work that let her be outdoors. She acquired a passion for working with pigs as an undergraduate student in AU’s pre-veterinary Animal Sciences curriculum. Blake also holds a master’s degree from AU in Meat Sciences, focused on pork quality. Her goal, she says, is to work in industrial medicine and perhaps later, in pharmaceuticals. The Swine Veterinary Scholarship is awarded in partnership with the American Association of Swine Veterinarians Foundation, the charitable arm of the American Association of Swine Veterinarians (AASV). Recipients of the 2017 Merck scholarship were announced during the 48th annual AASV meeting in Denver. Eligible recipients may be from American Veterinary Medical Association-accredited programs in the United States, Canada, Mexico, South America and the Caribbean Islands. In addition to AU’s Blake, other 2017 recipients included one student from Kansas State University; one from the University of Illinois; two from Iowa State University.